Some physicists, mind you, not many of them, are physicist-poets. They see the world or, more adequately, physical reality, as a lyrical narrative written in some hidden code that the human mind can decipher. Carlo Rovelli, the Italian physicist and author, is one of them. Following his best-seller Seven Brief Lessons in Physics, a book that the author himself was surprised to see becoming so popular, Rovelli has a more ambitious book out (written before Seven Lessons). In Reality Is Not What It Seems, he describes his view of reality — the poem he has spent a career attempting to decipher. His writing style is enchanting, as lyrical as a book on physics allows one to be. His references to other poets, in particular Dante and Petrarch, exude patriotic pride and the understanding, unfortunately rare in most physics departments, of the deep connection between the sciences and the humanities as twin partners in the human struggle to find meaning in a puzzling and mysterious universe. How could one face the vastness of space and the shortness of life and not wonder about our place and purpose? Writing a self-contained popular book on his ideas about quantum gravity — the theoretical attempts to bring together Albert Einstein's Theory of General Relativity and quantum physics, Rovelli had to rethread the often-travelled path of the historical roots of modern physics, starting with pre-Socratic Greece and advancing, through Galileo, Kepler and Newton to Einstein and quantum physics. But he does so with a fresh new look, showing a knack for summarizing difficult ideas in short and effective sentences. When describing how Einstein gave physical reality to Newton's inert and empty space, Rovelli writes, "the gravitational field is space...it is a real entity that undulates, fluctuates, bends, and contorts." When describing the strange new world of quantum physics, where we can only claim the reality of a particle through its interactions with others, he writes, faithful to the "relational" interpretation of quantum mechanics: "It is only in interactions that nature draws the world." Or, "The world of quantum mechanics is not a world of objects: it is a world of events." Rovelli sees the world as his (justly) beloved Ionian philosopher Anaximander did around 600 BC, as an eternal flow between events, some, like rocks or people, more "monotonous" (durable) than the ones belonging to the fleeting reality of quantum processes. The nature of reality is a very tricky subject. Can we make sense of it, get to the end of it? Or are we so imprisoned in our own ways that, like the slaves in Plato's Cave, we can't break loose of our chains? In my The Island of Knowledge, I traced humanity's evolving views of the world, also from the pre-Socratics to modern times, focusing precisely on the elusiveness of the very concept of reality and how it depends on our human perspective. To state, or believe, that the science we do brings us closer to a final, underlying truth seems to be as wrong historically as it is naïve philosophically. As Heisenberg memorably wrote, "What we observe is not nature, but nature exposed to our method of questioning." The way we see the world shapes our narrative describing it. Even through the objective lens of science, it is still the human view of the world. If science is the best way we have to avoid being fooled by our perceptions, it still reflects those perceptions. The human touch is in everything we create, science included. To a certain extent, Rovelli's view reflects this, as he retells the evolution of our answer to the question "What is the world made of?" — what philosophers would call ontology. In Newton's time, it was space, time and particles. After quantum physics and Einstein, it is spacetime and quantum fields. This is where the tension lies — and where we go to the edge of what we know, without any certainty of what comes next. It is here that hypothetical ideas such as string theory and loop quantum gravity, Rovelli's favorite answer, appear as the next step into the deeper aspects of physical reality. And it is here that passions and preferred world views often cloud one's judgement, biasing this or that goal with a sense of purpose that is undeservedly deemed unique or unavoidable. We are most blind at the end of knowledge, the boundary between knowing and not-knowing. What's the big problem with quantum gravity? On the one hand, Einstein's General Theory of Relativity has equated space and time with the gravitational field, an entity that stretches and contorts in response to matter and energy. This is physics with a notion of continuity, applied at large scales, tangible to us humans, even if with weird effects like slowing-down times and black holes in space. On the other, it's quantum fields, the notion that the very substrate of what we call matter and radiation is emergent from different kinds of quantum fields, electron fields, quark fields, photons and the like. Quantum fields offer an uneasy compromise between the continuous and the granular, where the particles we observe are excitations of underlying continuous fields, little energy lumps that bash against one another and with the particles of the detectors we use to measure them. Their reality is revealed as they interact, as Rovelli so clearly describes. The challenge is to somehow bring the notion of granularity to spacetime, bring the discrete to the continuous. This is the problem that has baffled theoretical physicists for at least half a century. Rovelli describes as masterfully as one can the basic ideas behind loop quantum gravity, how if we take the granularity of spacetime seriously, the concepts of space and time as we understand them dissolve — and we are left with a network of linked loops representing the fields that we attribute, at large distances, to spacetime. Applying techniques from quantum physics to the volume and area of space, it is possible to show that there is a finite spectrum of possible volumes and areas, a quantization of space itself, just as the energy levels of the electron are quantized in an atom. I was surprised that in the preface he claims his book is a first on the subject, even if he lists two others in the bibliography at the end. Both are very worthwhile; Martin Bojowald's Once Before Time: A Whole Story of the Universe and Lee Smolin's Three Roads to Quantum Gravity. Since Rovelli has worked with Smolin, I find the inconsistency curious. The construction is incredibly ingenuous and Rovelli proceeds to apply it to many different situations. The only point of caution here, and one that surely defenders of both loop quantum gravity and string theory would consider so heretical as to be certainly wrong (but I advance it here anyway), is that all arguments that we have to quantize gravity, that is, to quantize spacetime, are based on analogy. Why do we need to quantize spacetime? Because spacetime is a field and all fields must be quantized. 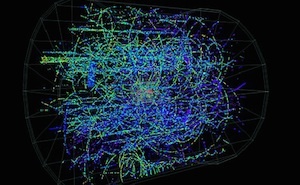 However, one could imagine that Einstein's theory is a beautiful description of physics that is only effective at large enough spatial scales, that there is no quantum granularity of space; that even though spacetime is described as a field, it is a very different kind of field from those describing matter and radiation fields, stuff that actually bashes into one another. In short, gravity is different. Reductionist arguments by analogy should be taken with a grain of salt. Whatever your take on this very complex issue — to quantize gravity or not, loop quantum gravity or superstrings or ... Rovelli's book is a gem. It's a pleasure to read, full of wonderful analogies and imagery and, last but not least, a celebration of the human spirit, in "permanent doubt, the deep source of science.